Once again, football season is soon to begin. As a boy growing up, my favorite football player was Joe Montana. For many he was known as Joe Cool which was a nickname given to him for his ability to stay cool under straining conditions and after he stayed cool he would make the right decisions that would always result in a comeback win which gave him another nickname, the Comeback Kid. If you want to learn to be calm in business under the heat and stresses of game then follow these lessons we can learn from Joe. No matter what game it was Joe Montana was able to play it without pressure, or at least that’s what it seemed like to us, the audience. This trait to separate the game from the pressure allowed him to come back from numerous losing battles and win them. Pressure is stress being applied to you. The more tense the situation the more stress and the more pressure you will feel being inflicted onto your bones, flesh, and mind. When pressure is cooking you start feeling the heat. You begin to sweat and palms feel slimy. Untrained minds at this moment break apart and show their frustration. When this happens others feel your frustration and will usually reciprocate those feelings with more frustration, especially when you experiencing the pressure with others. This isn’t good because the problem will only seem escalated. I say escalated because it appears as if the pressure is rising and the problem is getting bigger, even though it isn’t. Stop. Take a moment for yourself. Forget about the problem at hand. Forget about the pressure. And just play the game you’re in. This only takes a second to perform. You just have to think. Remove the pressure from the situation, such as: You’re in a business meeting with a high roller that can change your company into a Fortunes 500. Don’t think about being rejected by this high roller. Forget about her or him and only focus at delivering your presentation. You will notice you are starting to appear confident and the pressure is gone. Why would it be there in the first place? You can only fail once at one thing at one time, so let the failure worry about the failure. All you need to worry about is removing the pressure from the game (whatever it may be) then play it to the best of your abilities. If you’re working with a group of people they will become your teammates. In football it is easy to recognize who is on whose team. The red jerseys are with the red jerseys and the green jerseys with the green jerseys. Simple. But the simpler it is for you to recognize the team the easier it will be to have that team in disarray by the leadership’s mood. Joe Cool was able to pull so many comebacks because he managed to stay calm under pressure. This attribute created a ripple in the San Francisco 49ers and influenced the players allowing them to stay cool. The Comeback Kid was the quarterback for his team meaning he was the leader. It is paramount for the leader to stay positive and remain aplomb, regardless of the situation. If you’re not a leader then you have to re-examine your situation because everyone is a leader, even if they don’t realize it yet. Business is a team sport where everyone must work together if maximum profits are sought after. You, as the leader, can change everyone’s mood by how positive, or negative, you act. The more positive the better because the less stress is possible to enter the team, but the more negative you are the more pressure the team will feel as more stress creeps its way inside the business. So if you feel you are going to blow your top, think of these two things before you do: How will my team feel after I explode and can I turn my frustrations into results by keeping cool? If you think of these two things before you feel the need to let out your frustrations, you will find yourself as the best leader your business has ever known. I guarantee it. Remember when Joe Cool was playing against Purdue during his Notre Dame years? Eleven minutes left in the game, 24-14 Notre Dame losing, no other options left, Coach Devine put Montana in. At the time, Montana was third in the lineup of quarterbacks. Everyone else failed and it was up to him to show the world what he was made of. He finds the place where champions are born from and manages to throw 154 yards and wins the game for his team, but more importantly, for himself. Where did this ability to look at overwhelming odds and decide to make a comeback derive from? Was the Comeback Kid born with powers beyond that of common man? Did he have more superior genes than everyone else? I don’t think so. I think Joseph Clifford Montana was born with the same faculties the majority of other people are born with, but he lived in an environment that forced himself to look adversity in the eye and stay cool. Everyone can learn this ability, but not many people consciously seek it out. They happen to learn this trait along the way without their knowledge and then live life with confidence. But, you too can live life with confidence, if you apply this very important principle. When two high-power individuals speak they sometimes appear to be in a heated argument or debate, but most of the time they are just giving back the tension at a level most people cannot relate to. I believe most people are meek. This belief comes from the fact there are more workers than bosses. If everyone was strong and confident then there would be no unemployment, no world hunger, and peace would reign supreme. I know this because everyone would take their problems as their own and answer them for themselves, even in places of high poverty like Latin America and Africa. Do you want to be a high powered individual too? When situations of intense pressure arise, do you want to be able to take that tension, turn it into power and give it back to the situation? Then use this technique when you go about your business venture. Let’s say you just dropped the ball, and let’s say the game that you just dropped that ball in was the NFL Wild card game and you lost the chance to play in the Super Bowl to the New York Giants. You messed up and lost the game. The people who thought they were your “fans” turn against you and all you have left is yourself. Remember that the majority of people only hold you in their favor insomuch as you succeed. When you fail, the ne’er-do-well’s in your life called friends will make themselves known by their sudden opposition to you. They will voice their concerns of your failures and will try to drive people away from you and to their side. When this happens to you, or this may be happening to you at this moment, think of it as being extremely blessed. It is only in this chance in your life that you will be able to distinguish your friends from your fiends. If during great tribulation a person in your life offers a suggestion in how you might overcome such tribulation and exhibits faith in your ability to overcome, then they are a friend that you should keep in your life. If, however, a person in your life offers only negative responses to your tribulation and undermines your success then they are a fiend and you should remove them from your life. In your moment of intense suffering, it will be hard to find confidence to overcome your current state of affairs, but try this technique and see for yourself if it helps. Pretend to be confident when you are surrounded by others only. Forget about being positive when you are by yourself and all alone. If you can stay positive when you are at your lowest then great, but a lot of people can’t and don’t. There are so many people in extreme states of poverty or affliction that some, myself included, cannot understand where they are coming from. For example, a rich person who has never experience poverty will not be able to understand a homeless person who hasn’t eaten for a week. They cannot because they haven’t experience starvation and being without a home. So, now I speak to you, Mr. or Mrs. Homeless Person. You are in a state of being that only you can understand. You have only yourself to rely on and the people at the homeless shelter will give you a dinner for one night and then be on their way. If you can use this technique, it may give you dinner for all your nights. When you are in the company of people, imagine what the happiest person in the world might look like. Imagine the mannerisms and habits they may have. Keep this image in your head and when people are near you, or around you, practice these habits as your own. Pretend that these habits are yours. Know you developed these habits to create your $10 billion company. In other words, bluff your way to confidence. Everything in this world stems from your ability to exhibit a certain amount of confidence. The more confident you are the better you are able to perform and the quicker you are able to bounce back from failure. If you bluff your confidence to others, then whenever you’re around others you will feel confident. As this practice is continued, eventually you will be able to maintain this level of confidence when you are alone. Eventually, this practice will give you confidence when no one is around, and before you know it, you will be out of your tribulation, and that $10 billion company is out of your own doing, and in your hand. Bluff your way to confidence, and the next time you are faced with the next big game, you’ll throw the right pass to score the winning touchdown. When the offensive line spreads itself too thing then the defensive end or defensive tackle will be able to break through to your defense and tackle you. Your line isn’t focused at any area and so holes are revealed to the opposition and they take advantage of this weakness. In football it is easy to see this when it happens because you have a visual of all the players standing in the line with their leader, the quarterback, standing behind them. When the quarterback goes down before a successful pass is completed then either the line was weak or the line was too thin and the opponent took advantage of this weakness. In the business world, you stretch your line too thin when you dedicate your time to too many goals or tasks simultaneously. When you have to dedicate your mind to one goal then you can turn the entire power of your mind in completing that goal. However, when you have two goals, your power is spilt at half. When it is three then one-third, and four then one-fourth, and as you put more tasks to your mind the more it taxes it. Eventually, you will break down and give in to the pressure of the plethora of situations that have developed in your life. To understand this concept at a deeper level, it helps to look at the savant afflicted people. Divide your attention too many times and your performance will drop. If you are trying to sell a product to too many clients at a time, your performance will drop. It is how your brain works, and there is no way around it. If you want to achieve at a higher level, don’t stretch your line too thin and keep a narrow focus at your goal. Limit your power of the brain to one specific goal at one specific time and you will find a level of success that people will herald as genius. Joe Cool did it. Can you? When adversity is present in your life sometimes it is best to laugh at it. Let’s say you’re a marathon runner and you just lost your legs from a tragedy. This is an extreme lost. Maybe so extreme, that you are contemplating ending your life. Hold off for a second and try this out. Think of your passion and now think of the loss of that passion, and laugh at the ridiculous of it all. For a runner to lose her or his legs is ironic and irony is funny, so give a good chuckle. Create this tragedy into your own inside joke that no one but you will know of. Allow this joke to replace your tragedy and fill yourself with the power of laughter. Some people have claimed that they have cured their cancer or other severe illness through laughter. I’m not going to debate the validity of those statements, but I am going to point out that when you are in the middle of a laugh that lasts for minutes you are overcome with a surplus of positive energy. Remember what it felt like when your favorite comedian set you off for hours during their stand-up. Remember the time where you thought your innards were going to burst because you couldn’t help but laugh. And remember how that made you feel. You weren’t thinking about your problems nor were you thinking about present situations. All you were thinking was how good it felt to be in that state of continuous laughter. Imagine how good it would feel if you could laugh in your current state of tragedy. If you answered no then try it. I’m sure most of these professionals laugh when they talk about their rookie years as quarterbacks, running backs, or defensive linemen. Looking back at how they perform, they realized their suffering wasn’t a big deal because they see how it made them who they are today. Your tragedy will do this to you too. The sooner you learn to laugh at your own misery the sooner you will be able to move on to success. Think of it in this way. You can either stay miserable or move on to greener pastures. Also, there isn’t a problem in this world that cannot be solved, only the passion to pursue the solution. You can do anything in the world. Even tackle like a football professional. The Comeback Kid didn’t learn to turn it around and come back from behind in a day. His ability to win from a losing streak was gained after many days of practice and training. The experience he gained in football from playing in Ringgold High School, then in Notre Dame, then in the 49ers shaped him to develop his calm under pressure persona. No. He started out with a small goal that he could accomplish. First, it was to prove his ability as a quarterback to his high school coach. He knew if he pulled out a win from behind that the right people would see his potential. Then when the Notre Dame coach refused to put him as a starting quarterback, Montana had to prove his worth again through winning the game. He had to set a mini-goal to accomplish his larger goal to become an NFL player. 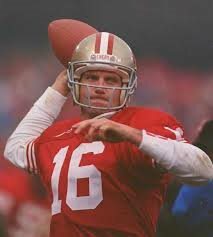 Joe Montana won three MVP awards, but he was third round, 82nd overall draft pick. What this tells us is that you have to believe in yourself before others will believe in you. One technique to find this belief is to look at your main goal and then to set a road map filled with mini goals that you can accomplish today to reach your main goal of, say making $1 million.An example of what a mini-goal might look like is this: “I will read one book on marketing in one week.”This goal is easily achievable by going to the library and renting a book. It’s free and you can start it today. This is what I mean by a mini-goal. If you look at your main goal then it might seem so daunting that it discourages you from ever dreaming that huge. Once you say you can’t do something then you handicap yourself from what you can do in this life. You are self-limiting your potential. Set the mini-goal and reach it. Re-evaluate your main goal then set another mini-goal, and repeat this process until you have the confidence to directly pursue your main goal. Remember a mini-goal is something you can start today, accomplish quickly, and gives you the bit of confidence you need. At some point in our lives we will lose our cool. The stress builds up and up and the pressure becomes unbearable. We can no longer get it in us and so we let it all go. Your face flushes red and you begin raising your voice to levels that no longer renders you coherent. When this happens you lose people’s respect and lose yourself. When you give in to the pressure and let your anger fly, you become blind to the situation at hand. You no longer have the ability to see the causes of pressure and address them in an intelligible manner. Before Joe Cool became Joe Cool I’m sure he blew his top plenty of times or he didn’t blow it at the wrong times, such as at a game, but more importantly he managed to learn from his blow ups. The worst thing you can when you allow yourself to show your anger is to feel bad about it afterwards. Nothing will change for feeling negatively. The people that witnessed your tantrum won’t forget about the incident or regain their respect of you instantly. No. The only thing that you can do is learn from the incident. Don’t feel badly because that will only prepare yourself for another incident where you give in to pressure. Instead, learn from the incident and analyze why it occurred in the first place. Can you prevent another blow up? Will you employ the methods described above to contain your stress and remove your pressure? If you embrace the attributes described above then you will be less likely to lose your cool. Once you get your cool back now you have to get back on track. You probably lost track of your goal while you gave in to the pressure. Lucky for you it is very simple to find your way again. All you need to do is ask yourself where the pressure came from and then aim to remove that obstacle. The cause of this obstacle is most likely the cause of all your stress. Focus on the solution and you will have found your goal.